I jumped out of bed and showered in my glass shower, while watching the morning news. I got ready in record time. Then I did my hair and redid my hair. I had the barbies in a liquor box. (So they each had their own slot of the the waffle divided bottle compartment.) I took my booze box and my purse then went to the door. I took a deep breath in front of the door. I held on to the door knob. I thought of my husband and his kind words of support, love, and power, as I swung the door open and marched down the hall to elevator chalk full of bravery. I was saying, “You go girl!” and, “STAND UP STRAIGHT!” to myself. There was no one in the lobby, but outside was a double-decker site seeing bus. So. I went out to see if that was where I was supposed to be. “Hi! I’m Susi!” You know, after all the waiting, I half expected there to be clapping, or back slaps, or Heidi to pop up. Everything was strangely quiet. Even the city was strangely quiet. It was 6 am after all. This time was our introduction to the TV industry. I just soaked it all up. Everyone on the crew had an ear piece, like the secret service, but they don’t nonchalantly touch them or say things like “roger” or “red fox to home base, we are a go.” Instead, they talk to other people, that you cannot see, all the time and that is unnerving, like when someone is standing very close to you and speaking another language. Clearly they are talking about you and you just have to hope it is flattering. “Okay,” I nod and smile. It’s a battery pack, that is clipped to my bra strap, then the thin wire runs up my back, over my shoulder, and a tiny mike is glued on the inside front neckline of my dress with something that looks like a tiny foam bandaid. He says, “Yep.” (pause) “Yep.” to the person talking to him in his ear. Then he turns to me, “We need you to do a sound check. Can you talk for me?” I start some inane running commentary like, “we are here, on this bus. Check. Check.” and he makes a rolling sign at his waist. So, I need to keep talking. Then he makes the “stop” hand at me. He listens to the imaginary voices. Then he looks at me and smiles, “Good. We’re all set”. No one was really talking. I had to fight the urge to just stand up and say, “HI !! I’M SUSI!!! CAN YOU BELIEVE WE ARE HERE!!!!?!?! ?” And fight not to hug everyone ” hello”. I will admit now, that I really thought there was a chance that they had brought too many of us on and that they were going to weed some of us out, like in a competition or a trivia contest or something. I just could not believe that this was REAL. Maybe they only needed six of us. So, how were they going to choose? In hindsight, they had organized it the way they did because they wanted to capture our interactions on camera. But I didn’t know that at the time. It was so early in the morning and we were all so “in the dark” about the plan, and the numbers, that I am not sure they got what they were looking for. We rode around in the city. I mean, around. I think we went around one block a couple of times. 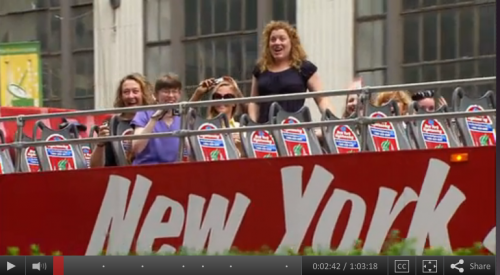 Please note – if you ride on the top of a double decker bus, in Manhattan, remain seated. If you stand the trees will brush your hair. And there are some street signs and stop lights that may have the potential to decapitate a tall person. No joke. Some of the bus squeal scenes were very real screams from near miss “swoosh”s. And then giggles because we had cut the tension. Around and around we went. I have visited NY before, but I am not THAT familiar with the layout. So the surprise of pulling up to Parson’s was genuine. I saw the sign and freaked out. I popped up, saw Tim in the courtyard, and I think I burst a head gasket! I am not kidding. 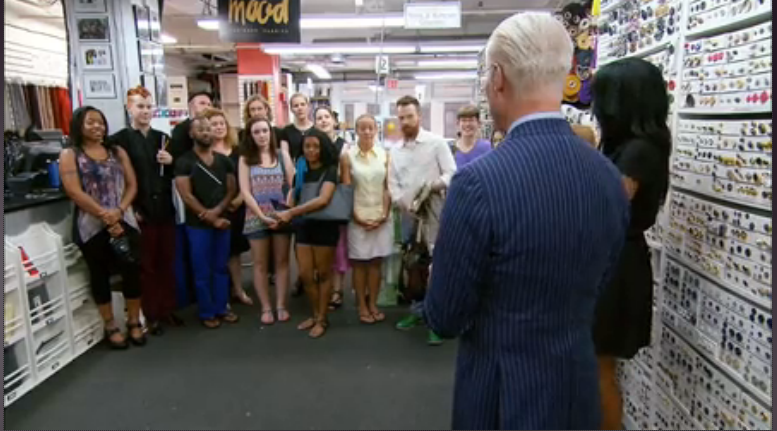 After waiting and waiting, and not knowing, the fact that Tim Gunn was actually waiting for US! Outside! It was THRILLING. I adore Tim Gunn. FLAT OUT. I lifted up my camera to take a picture and then just let it go as fast. I thought, “forget the camera! They are FILMING this WHOLE thing. GO! Live! “. And I tell you what, I wanted to get down those silly bus stairs as fast as my gold sandals would let me go! At this point, time went into warp speed. The rest of the day was a swimming pool of glorious dream-come-true, behind the scenes adventure. Tim is just as lovely in person as he comes off on TV. He is impeccably dressed and exudes professionalism and warmth at the same time. He whisked us all into Parsons and showed us around casually. We walked on the runway and had a BALL. Then we were taken to a holding area. It was a strange kind of in-between room, neither here nor there. The elevators opened right onto it and the stairs fed into it, but it was a storage area too. There were a LOT of sewing machines and tables and french dress forms in the room. We got to know this room well. It was the “models” area and every time we were not on camera, that is where we were. “We” had 30 minutes to sketch, and then we were going to Mood. And that is exactly what happened. We met. Ken sketched and then we were taken out of the room and escorted back to our holding area. Downstairs, we got in a van. There were 3 vans and we were always in “C”. The designers were in one van. The “models” were in another van. And then, in a third van, they had all the eliminated designers. (Record scratch.) Oh yes, there is a van full of eliminated designers. ALL of them. Now, this will not come as a shock to you, the fans of the show. Fashion week was just after Labor Day and we had 8 designers show collections there, because “people are watching”. If only the finalists showed collections while the season was airing, then fans would all know who the finalists were and they would be forced to tweet that immediately. !! In that same light, all of the designers travel together for the entire taping of the show. We went to Mood and we were taken in up the stairs. We stood on a landing in back stair well. (Which by the way has majestic old iron work railings.) “Ice Please. Ice.” Whisper whisper. “Ice please. HARD ice.” (translation. SHUT UP.) But it is delivered gently. This part fascinated me. We are standing in the stairwell and the designers have been prepped by their production people. They are holding lists or notebooks, but no purses or personal stuff. “Ice please.” But wait, I have 500 questions!!!!!!!!!!!!!!!!! “Go” is whispered. The doors open and we are by the front check-out counter at Mood. It’s Sunday. So the store is not open. Cameras are EVERYWHERE. The staff are everywhere too. Tim is waiting for us. We gather round in a semi circle and then camera’s roll. I talked about shopping at Mood in my previous post. So I won’t repeat here. I did take a moment here to find Tim. He was by the magnificent buttons, across from the register. I was miked, but I had decided I did not care if this was on camera or off, I wanted to talk to Tim. I went right up to him and said, “Tim. ” He said, “Susi, yes?” And I completely froze. Tim Gunn knew my name! Oh, I nearly shrieked. There were no cue cards, no notes and I had just met him yesterday. Tim Gunn knows my name! The end! My experience is complete. “AND, thank you for always using big vocabulary words! I love that! My Dad was a professor, and he had a huge vocabulary. He would use big words. And if you ever asked him what a word meant, he would smile and define the word with two other words you DID NOT KNOW. So then you were sent to the dictionary with three words to look up.! I love when you exercise your vocabulary.” From there we went on and had a whole conversation about big words. He lit up. He talked about his books (in a proud Papa way, not in a marketing way.) and the writing of them. 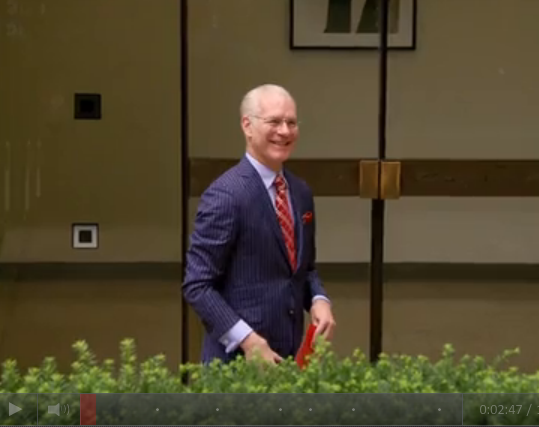 Tim Gunn is not just a nice man, he is SHARP, people. “Thank you Tim. Thank you so much.” He smiled a big smile and off I ran to catch up. I was looking all around Mood, such a magnificent store. There is a whole “laminated” area and upholstery fabrics. And then, something caught my eye. There were a bunch of people crouched in a corner behind one aisle. I did a double take. OH MY WORD! 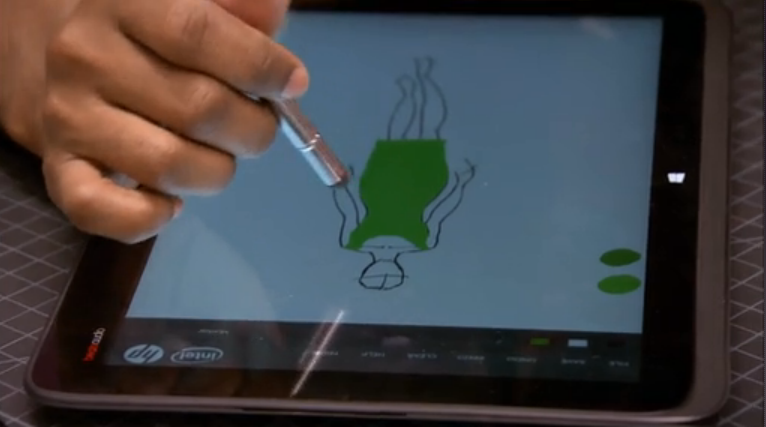 Those were the eliminated designers! Most of them had their heads down, but one didn’t. Sue was looking right at me! She smiled a huge welcoming smile and nodded at me. I smiled back at her. I recognized her from her picture that I had seen on the internet. I wanted to point and call everyone over. I wanted to go and meet them, but I was miked and I didn’t want to cause trouble or give anything away. I looked back at Sue, nodded and smiled, then went back upstairs. When we left Mood the process was reversed. (fFor the record, we were inside Mood for 45 minutes, exactly as it is presented. The whole process took longer, but the shopping time at the store was exactly as they say it is.) We stood on the landing again. Eight designers, their Production people, eight superfans, and our production people. Each designer had a plastic envelope (like a coupon clipper organizer). This operation was done with precision. The phones/cards and receipts were collected and put in the plastic and filed in the very important box. This was my our introduction to the “Go Phone” and the new budgeting concept. I am VERY excited to watch this as the season winds down, and see if some people will have lots left, or if some people will have to really scrimp. I think it adds an element of reality and “design business” to the season. Sometime during the day, we went to do the “confessionals”. I was so NERVOUS for this. One by one, we were taken out of “the model room” and brought to the room that was set for up for filming. I walked in and I was so distracted because I was looking for the three dress forms behind me. I know that is a silly detail, but I kept looking for them. These “confessionals” are very natural and unscripted. No one told us what to say. (Of course, someone was asking you a question, but it’s an interview afterall.) The room is set up with the white paper background. And cameras. And big lights. Then there is a sound guy. And another guy. And a camera guy. And then, right in front of you, there is the nice Producer woman. She is very encouraging and easy to talk to. Then there are the instructions. She explains that she will ask a question and I will answer, but in the present tense. As if it is happening right now. And, I am not to look at her, I am to look at the camera, but answer her question. She is sitting JUST to the left of the camera. It was SO STRANGE. If someone asks a question, you answer THEM. You look at THEM. So it started to just feel rude. (By the way, where are those dress forms.) The Producer tried to help me out by phrasing the questions in present tense. For instance, “So, you are at Mood. What is it like?” I start to say “Oh Mood was FANTASTIC.” and then I stop, “Sorry.” “Here we are at MOOD! How great is THIS!?!? !” “MOOD!! !” My enthusiasm is genuine! But it is so odd to use the wrong tense. It messed with my head. Now, I watched the show and those “here is what I am thinking” clips have been added to the middle of the scene. I personally find them helpful and wonderful. Just when you say “what were they thinking when THAT happened?!? !” then they cut to a little “confessional clip” and it is as if you are hearing the thoughts come right out of them. NOW, it all makes perfect sense, but I can tell you, at the time it was like a very hard word game. I don’t know how long the day went on. I don’t know when we left. We rode in our van back to the hotel. I think I showered, and fell over into my electric bed. I was lucky. My call time was not the earliest for the next day. We were going in shifts to get our hair done. And I will write about that – soon. <div style=”font-size: x-small”>If you are not reading this post in a feed reader or at http://justcraftyenough.com then the site you are reading is illegally publishing copyrighted material. Contact us at justcraftyenough AT yahoo DOT COM. All patterns, text and photographs in this post are the original creations &amp; property of the author unless otherwise noted. 6 years ago by Susi in Project Project Runway | You can follow any responses to this entry through the RSS feed. You can leave a response, or trackback from your own site. Keep the behind the scenes scoops coming. And what a non-surprise: Tim Gunn is just as gentlemanly and wonderful as you’d think he’d be. Lisa, Thanks for the support to our blog! Tim is “all that” for sure. Niki, Tim has been a favorite of mine for a LONG time. Thank you for your nice words. Thanks for sharing the scoop. I have couple of questions. First, what was the purpose of bringing eliminated designers to Mood? Second, did you see Sandro there? Valerie, First, you are so welcome. Thanks for visiting. 1. People are watching. All the time. And when the designers go to Mood, they are in view of the public eye. So, let’s say that you were visiting NY and you saw a bunch of people, and Tim Gunn rushing into Mood, you could take a picture. And you could go home and figure out which designers were on the show still. And that was before the first episode even aired. To be honest, I am not sure if Sondro was there. You know, we had met all of the designers only hours before that. And the whole group had their head’s down and even their backs to me. 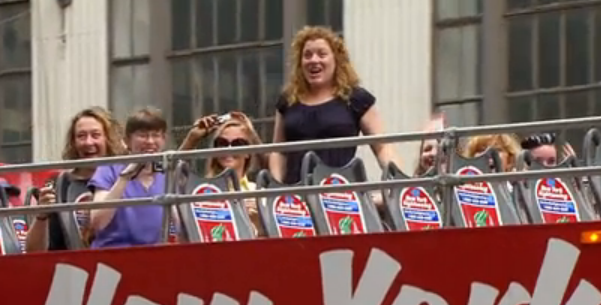 I only recognized Sue because she was looking right at me. And because she has a big smile and distinctive hair. So I recognized her from looking at their profiles the night before. Jaimie – wow! Thank you! That is really nice! 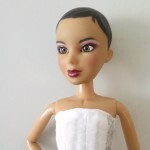 Susi–I’ve done the Project Runway and the All Stars challenges since Fall of 2008 on my blog for Mattel’s Model Muse and Monster High dolls. 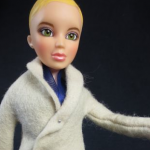 It was great seeing you on the show–I’ve been directed to your doll fashion photos by some of my readers and Flickr followers before, so I’m glad you were one of the Super Fans! Becky, NICE! So you are all too familiar with the real challenges behind the challenges. Thanks for visiting us and saying hello! Feel free to join our Project Project runway! We would love to see your looks!! Susi, I’m so thrilled for you that you had that conversation with Tim. And so pleased to know that he really is as nice as he seems to be. I know it is silly, but I sort of feel like we were all there with you! This is AWESOME. I am loving the behind-the-scenes and can’t wait for the next installation! Thank you so much for giving us the scoop … next best thing to being there ourselves! Susie, congrats for being chosen to go do the show! It’s fun to hear about your time there. Can you tell us why the blond “superfan” was crying back stage? Personally I think the hair salon did her quite an injustice by whacking her hair off and I wondered if she was upset about her hair. OH OH OH! Love love love this! Thank you for sharing your wonderful adventure! AND to be able to have a real conversation with Tim! How extraordinarily (trying to use a big word – lol) wonderful! Judy, Me too! I loved loved loved it. !! Thanks. I am loving hearing all the behind the scenes for PR. I am so excited for you, you were so enthusiastic and I feel as if I know you, through the blog and flickr, even though I’ve only joined the Project Project Runway group a couple weeks ago. 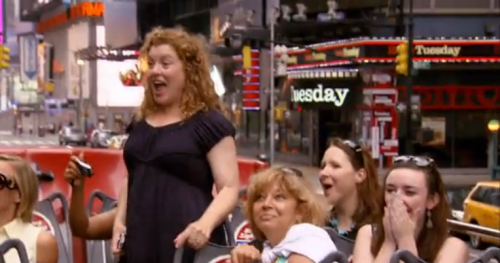 You are very brave for going up to Tim Gunn and speaking to him on your own! I have friends who refuse to talk to any celebrities we run across because they are too shy to say anything to such a famous person. I’m always the one who has to ask the question, even though I am not usually a fan. They’re people too! Good for you. I’ve got a question to ask you, a new celebrity (! ): Was Ken really barefoot in Mood?? A picture from one of your previous posts made it look like he was. I wonder why he would do that. I can only imagine how strange it was to be on TV, working with people you’ve seen only there and with others we never see at all, though they’re integral to the show. And watching the edited, polished version afterward it must have seemed that you were sort of subsumed into the program! Thanks for posting all this! Oh my gosh Susi! When Tim called you “the effervescent Susi” on the episode I just about died for you. So awesome. Dream come true for sure! It’s been so fun to read these behind the scenes posts. Was that a blonde wig on Brandon’s superfa? Love your stories!